Cleaning your golf grips will make them last longer. 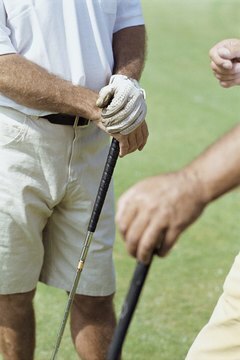 If you play golf often, you know that dirt and grime builds up on your grips, which makes them slippery. It is important to keep your golf grips clean so you can lengthen their life span. A small investment of your time could end up saving money in the long run. Fill a bucket with water and add detergent. Soak a towel in the bucket to get it wet and soapy. Rub the grip diligently with the soapy towel. Rinse the grip with the hose, making sure all the soap is washed away. Let the grip dry for 12 to 24 hours. When dry, club is ready for use.